The continuing saga of The Great Tortellini -- climber, escape artist, and Chou Chou Briard's new housemate. I advertised to find his owner -- he is a Mediterranean tortoise, not native to the US, and was clearly someone's pet -- but no one claimed him. So I named him Tortellini ("No, no! I named him Tortellini!"). 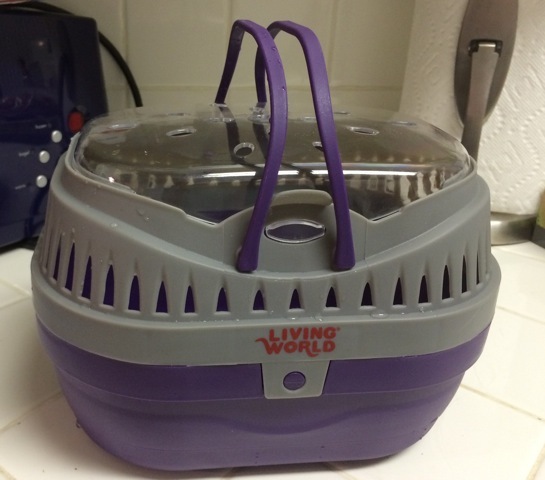 When I knew he'd stay with me, I bought him indoor and outdoor wooden tortoise houses, and a carrier to take him to the vet for a checkup. I make sure that he gets exercise, has foraging time on my lawn, and that his diet is what a Hermanni Hermanni tortoise should be eating. Tortellini likes to climb! For a few days, before I knew he was staying, he was in a glass aquarium I already had. 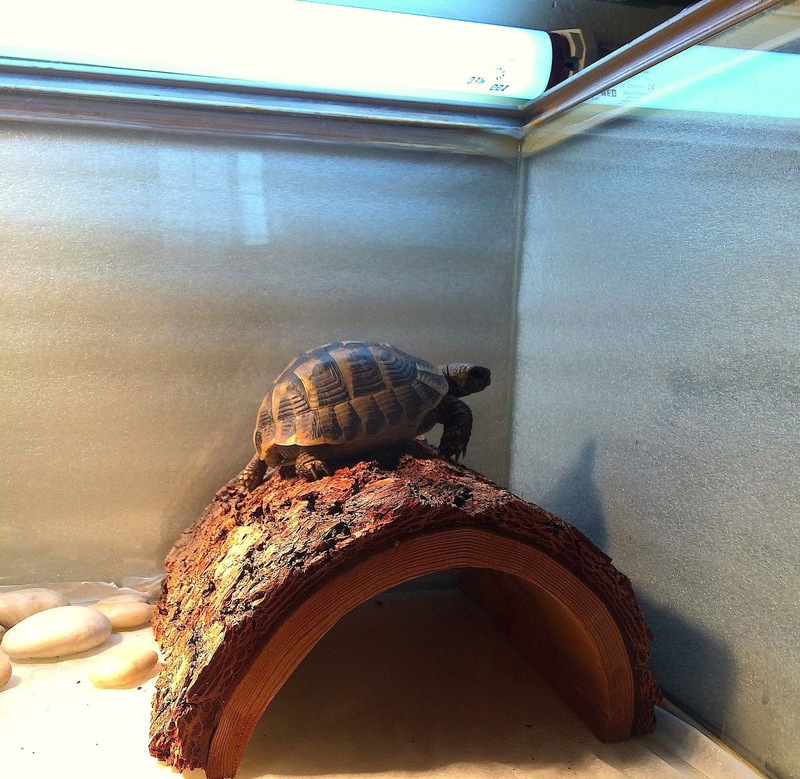 Instead of going inside the hollow log to hide, he would climb to the top and keep falling ("I think jumping!") straight off the front edge, landing on his back. Very dangerous for a tortoise with a heat lamp! I removed the log, then replaced the glass enclosure with wood. Much safer! At other times he tries to climb out of his bathtub. ("Oh! I would never do that!") I know he's quite the escape artist; after all, I found him wandering after he escaped from his last home. And he likes to stand up tall against the wooden side of the house, pressing his shell flat against it. He stays this way for long periods of time and seems to be comfortable. To make the enclosure less bare, I put a pansy plant in his outside enclosure. There were low stalks he could reach easily, to eat. But no, he kept climbing the pot and falling off; so I took the plant away. He's quite an ADHD type of tortoise! He's quite an ADHD kind of tortoise!